I returned Tomb Raider: Underworld to Gamefly. No, I didn’t finish it. The game evolved (devolved?) into something unplayable, and I just couldn’t take it anymore. I had to call the whole thing off. The new and improved Tomb Raider was such a wonder to me when we reunited in Legend. Although there were things I loved about the old games included in Legend’s revamp, some of Tomb Raider‘s bad habits – such as bugs and an angry, flighty camera – had been completely shed. I was in love again, and it was with a girl named Lara. In Legend, the combat system was solid, the puzzles complicated, yet entertaining. The way they progressed through the level, looping you back around to the main root of the puzzle – oh, it was like playing through a God of War puzzle, where all the elements fall into place. I knew Legend wouldn’t change the face of gaming, but the new team behind it gave me something fun that wanted to play with me as much as I wanted to play with it. Tomb Raider went away, sent me a lovely “hello” in the reproduction of the first game Tomb Raider: Anniversary. I could not wait to see it again after that, but when Tomb Raider came home as Tomb Raider: Underworld, something was different. Underworld picks up where Legend left off, sort of. Lara is following her father’s clues to lead her to Avalon, where all heroes and Lara mothers go to die. The plot then waffles in the importance of these parents. Natla is back because no one wants to invent a brand new character, her best frenemy Amanda is there, too, bitching and moaning about everything. After checking with a very reliable source I call “Stephen” – who is like Wikipedia with a circulatory system – I learned these two threads collide in a sloppy mess. I followed this up by investigating some posted videos of the game’s final hump before it fades to white capping off what can safely be called the shittiest ending of a game I have seen in a while. The mechanics are all over the place, totally slap-dash. Bugs even managed to slip through the cracks. One particular bug in Mexico held me up, but there have been several complaints on-line regarding other game stopping bugs. Anyway, I had to play back through the level more than once to fix this since it was so temperamental. At that point, coupled with smaller bugs such as being stuck in animations and the occasional very clear and present box effect, I had almost reached a point where I was ready to pimp away. I reached that point when I learned the creator of the series is looking to do yet another overhaul of not just the game, but the whole Raiderverse. It is a trend that has snuck its way into geek culture and is about as bothersome as the “remake” trend in Hollywood these days. At that point, Underworld became irrelevant for me. Considering the series has already been revamped, and already released a return to the first game, reinitializing the series seemed counter productive. What good there is to be said about Underworld is just too little. I don’t know if I can applaud the new mechanic that shows Lara becoming progressively “dirtier”, because the only image I get are giggling gorillas grunting about how “she… she gets dirty, snark snark”. However, it is something I have wanted to see in a game before; the progressive environmental affect on a character throughout the game. The team in charge of building the environments were spot on. I actually found myself going “whoa” when I entered certain stages. My favorite was the sinking military freighter, and the ruins in the game were absolutely gorgeous. The character designs were a little weird and ran the gamut between steroid injected panthers and humans designed on the whims of an afterthought, but when creatures like the kraken in the beginning needed to be larger than life, the final product really was something. I have to heap some praise on my Keely Hawes, Amanda Soucie, and Grey DeLisle. These girls had a scary script to work with, but they brought as much as they could to their parts. I love Amanda and Grey, in fact, I’m a huge fan of their work, and Keely brings a vulnerability and bravery to Lara that I really admire. The same cannot be said for the final game. I consider myself a very casual fan of Tomb Raider, I played the first game the day it came out, and meandered through the rest. 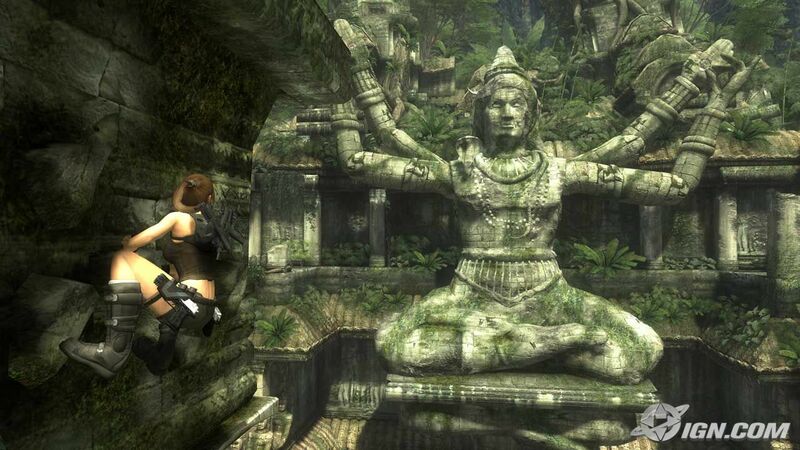 I always likened the Tomb Raider games to Indiana Jones movies in regards to ancient, lost artifacts, how their history shapes the searching characters, and all of the exotic locations in between. What Jones has over Croft is his own rogue’s gallery of assorted twisted, obsessive baddies. It is risky to introduce new characters, but it can be quite rewarding too! Legend was interesting because there were new bad guys for Lara to fight, new allies for her to trust, but with Underworld there is no risk being taken! Even if this game was mandatory before the crew could move on to the new series, don’t you think you owe it to the fans (and gamers in general) to put out a decent game? Lara Croft, whether you like her or not, is an iconic video game character, and won’t be going anywhere for a while unless more “look what I made in arts and crafts” games like this keep coming out. At the end of this game, if you are stronger than I and can make it that far, you will need a few bottles of wine, and a box of tissues to keep you from crying into your comfort food. For all of its beautiful vistas and attention to artistic detail, the gloss did little to cover up the completely broken game underneath in Underworld. If there is going to be a revamp, please, let’s clean this girl up a bit before she gets dirty again *cough* Angel of Darkness *cough*. Coming Soon! The dish inspired by the game, especially that pesky Mexico level. The carne asada fajita-burrito with sweet honey guacamole and corn-black bean salsa! I found the game to be fine. I bought it when it came out, and cleared it twice before the year was over(It came out Nov. 18th). Recently, a week or two ago, I was juggling 2 save game progress’ in Tomb Raider Anniversary and Underworld. 2 in each game, one for me. One for a friend who found the game cool but just couldn’t play it. All 4 are already cleared, very easily at that. Now this Angel of Darkness, Survivor and some of the things they tried to work into Chronicles….i-dunno. Tomb Raider should be strictly ruins, monuments and landmarks(and myths–altlantis, thor/greek gods, etc.). It doesn’t need to be 100% isolated play, but a large portion won’t hurt with today’s visuals and audio. Good call, Dream! I think I was just a little spoiled by “Legend”. To me, despite some things the game did have going for it, the game just didn’t really click with me technically. It felt a touch rushed. I am curious to see what they do with “Survivor”, for sure. There was a lot of human and some urban interaction in “Legend” and it actually struck a really nice balance for me (there’s danger everywhere if you happen to be named Lara Croft, that sort of thing). However, I do agree. After “Survivor”, I would also like to see a return to some of the mythologies. Especially, Arthurian. The series flirts with that a bit. I feel like there were a lot of convoluted things happening in Underworld. The other games were easy enough, but I actually enjoy the difficulty of the first 2 original titles more than the hand-holding of the newer titles. The current title was enjoyable, and I look forward to reconnecting with Lara once again via this blog. In the end, I don’t really care how easy or difficult a game is, but bug-work-arounds break the overall gaming experience. I love game immersion more than anything, and is a really easy way into my reviewing-pants any time, so when a game-stopping bug (not a minor one, those are sometimes unavoidable) happens in a big title from a big studio, it’s jarring. I am not sure what system you had your playthroughs on, but XBox was unnnnnfriendly when it came to Underworld. Anyway, super delayed post, but I agree with pretty much everything. I remember when I was little and the first Tomb Raider came out. The popular handle to give Lara was “Indiana Jane”, and for me that is the feeling I hold every game up to. It should always feel like a classic adventure into something unknown, something old, something dangerous. The tombs were gargantuan in the original games (at least what I remember as a Little OurLadyWar), and there was no such thing as being able to clear something “very easily”. The game challenged you, and the reward was in meeting the challenge and overcoming it with the adventuress.